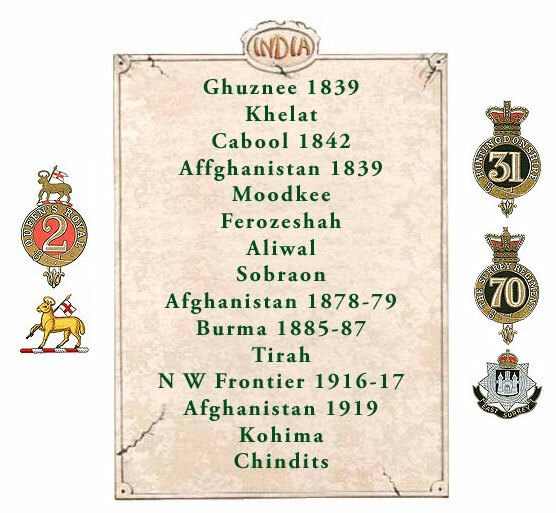 Regimental India was written by a Surrey officer, Brigadier Michael Clarke, who had served six years in the Indian Army during World War 2 and afterwards, before partition and independence in 1947. It was first published as a Supplement to the Newsletter. Brigadier Clarke became Chairman of the Regimental Museum Trustees, and it was during this period that he resolved to record the Regiments presence in India, of at least one of the Surrey Regiments with hardly a break from 1825 until 1947. The first two to go there, the 2nd Queen's Royal and the 31st Regiments, arrived on the same day in June 1825 but on opposite sides of the country having left the River Thames during the same week in the previous February, and that seemed a good starting point. There are occasional minor variations in the spelling of place names. Inevitably the English version sometimes changed over the years. The best known is perhaps Puna for Poona. Another is Afghanistan which is spelt Affghanistan on one of the colours on display at the Museum. The drawings/water colour sketches were completed by a member of the Regiment, Private Arthur Bell, of the 1st/6th Bn The East Surrey Regiment, during his service in India in the First World War. He was a young soldier who had received no formal education in art and he maintained sketch books which have survived to this day. His daughter later retraced some of her fathers' footsteps.